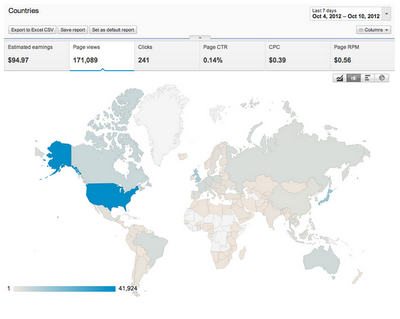 Interested in attending one of these upcoming AdSense in Your City workshops? Please fill out our interest form. Space is limited and so we won’t be able to accommodate all requests, but we’ll let you know if we’re able to extend an invitation. We also recommend ensuring you’re opted in to receiving ‘Special Offer’ emails so we can reach you in the future. We hope to see you at an upcoming AdSense in Your City workshop! This November, our international teams will be hitting the road to host more AdSense in Your City workshops around the globe. During these workshops, we’ll provide product updates, offer individual optimizations to help boost revenue, and share tips for getting started with solutions like DoubleClick for Publishers (DFP) Small Business. Also, these workshops offer attendees networking opportunities and the chance to meet with local publishers. Italian site Ultimoprezzo.com provides a unique service to online consumers. It supplies information on stores and their opening hours, as well as their best prices for smartphones, TVs, tablets, laptops and other consumer electronics products. As a supplier of free services, Ultimoprezzo needs to be savvy about its strategy for generating revenue. AdSense provides a straightforward solution. “The Google AdSense program is the ideal way for us to monetize our publishing efforts,” explains founder and CEO Alberto Giacobone. 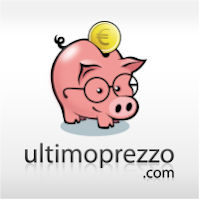 He says Google AdSense not only provides Ultimoprezzo’s users with relevant and interesting advertising information, but also provides its advertisers cost-effective ad placements since Ultimoprezzo doesn’t need to maintain a sales network. Very early on in Ultimoprezzo’s development, Alberto’s team perceived an opportunity in the mobile space. An internal team developed Ultimoprezzo’s mobile-optimized website, while a special agency developed applications for iOS and Android. So has the company seen an uplift in mobile traffic? “The trend is clear,” says Alberto. “Mobile traffic is growing and is now already more than 15% of our total traffic. And this is not only down to the growing popularity of smartphones which cost less than $100; what we notice is that the users are getting better at exploiting the technological tool at their disposal more and more frequently.” With Ultimoprezzo’s non-mobile traffic volumes booming as well, by the end of 2012 Alberto estimates mobile will account for one-third of the company’s total traffic. This information is current as of October 23rd, 2012. We've shared quite a bit of information on using Google+ for your business in the past few weeks, and so we'd now like to pause for a moment to hear from you. After reading our Social Fridays posts, do you have specific questions about developing a Google+ strategy for your site? Are you interested in hearing more about a certain topic like using Ripples or avoiding common pitfalls? To address your Google+-related questions and experiences, we’ll be hosting a Hangout On Air on Tuesday, October 30th at 10:00am PT with a Google+ specialist from the AdSense team. Visit our AdSense +page to RSVP to the event, and feel free to post your Google+ questions there. Anyone will be able to watch the live Hangout On Air, and if you miss it, we’ll post the recording to our YouTube channel so you can watch at a later time. We hope to see you in our upcoming Hangout! 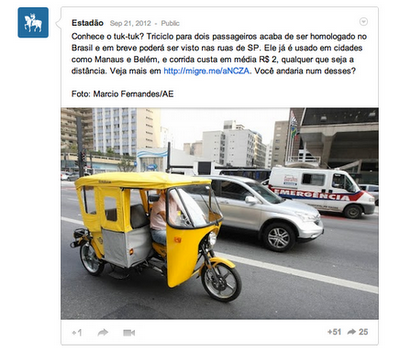 We’ll be back next week with another Google+ publisher success story. The list of metrics has been moved from the right hand side to the top in an interactive scorecard. There are new buttons for day, week and month for the usual timeline graph to allow for more control over granularity when analyzing activity over longer time periods. You can choose “Events” on a timeline report graph or select the “Events” report from the left navigation to see how specific account changes are related to account performance. We hope you enjoy these changes -- stay tuned for more updates. For additional information visit our Help Center and feel free to leave comments and feedback on our AdSense +page. Your performance reports are the key to understanding your AdSense account activity and earnings. This is where you can get vital information about your account, quickly and easily. We’re constantly working to enhance performance reports, and so today, we’re introducing some changes that improve the usability of the reports and make them more visually compelling. The graph area covers a wider area of the screen. Temptalia is one of the most popular beauty and makeup review blogs on the web, responsible for delivering the latest product information, tutorials and in-depth reviews to numerous fans. Given the blog’s global following, it’s easy to imagine a huge staff working behind the scenes, but in fact founder Christine Mielke still runs the blog herself and creates the vast majority of the site’s content. In addition to running the blog herself, Christine maintains a focus on social media for Temptalia. Christine established the +Temptalia page on Google+ not long after the platform launched, and continues to encourage fans to +1 and link to the brand’s page. 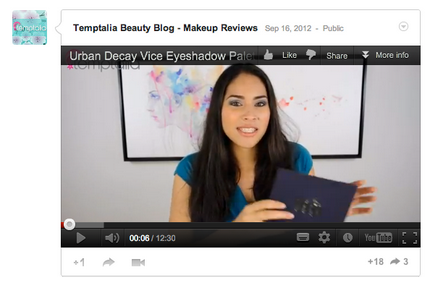 On average, six new posts appear on Temptalia every day, and each of these is promoted through Google+. She says content that includes photography shines on the channel, and pretty products and colorful cosmetics tend to grab more attention than skincare. Google Analytics is key to helping Christine understand how each social media channel contributes to the blog’s traffic. Designed to make analysis easy, Social Sources reports in Analytics automatically segment referral traffic from hundreds of social networks. By using these reports, Christine can see that Google+ is among the top 10 social referrers to Temptalia, along with other Google properties including YouTube and Blogger. But to get further insights into the audience, Christine looks beyond the numbers and goes straight to the users themselves. “We try to listen in what our readers are asking for, what they are looking at, what they are most excited about,” she explains. This user-focused approach continues to drive Temptalia’s success. Christine’s advice to those getting started with Google+ pages is to use the channel as a valuable research tool in understanding a site’s readership. While Temptalia may be a small operation, its impact is significant – already Temptalia has over 600,000 followers on Google+. To read more about how Christine, a lifelong beauty enthusiast, is using Google+ to maintain, build and serve her blog’s audience, read the full case study. Affiliate Ads for Blogger now in the U.K.
We’ve blogged before about Google Affiliate Network, which helps you earn more from your site with ads that pay based on conversions. Earlier this year, we launched Google Affiliate Ads for Blogger in the U.S. The positive results and feedback we’ve received are very promising, and we’re excited to announce that this gadget is now available to Blogger users in the U.K.
Google Affiliate Ads for Blogger is a gadget that makes it easy for Blogger users to insert an affiliate ad into a blog post and earn a commission when someone clicks the link and makes a purchase on the advertiser’s site. If you’re a Blogger user in the U.K. (or the U.S.), sign in to AdSense and go to the Earnings tab in Blogger, or sign up if you don’t already have an AdSense account. When logged into your AdSense account, you may see the Google Affiliate Ads for Blogger gadget when you write a new blog post. This gadget is available to select U.K. (and U.S.) Blogger users whose blogs match available ad categories, so that’s why you may not immediately see the gadget even if you have an AdSense account. 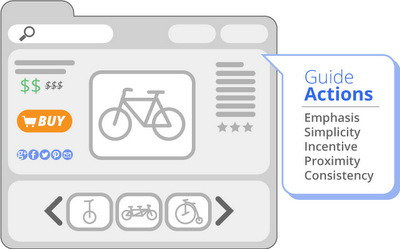 Select a relevant affiliate ad from the 'Advertise Products' gadget. For additional questions, check out the Help Center or contact The Google Affiliate Network team. Your use of the Google Affiliate Ads for Blogger program is governed by the Google Affiliate Ads For Blogger Online Program Terms and Conditions. Please review the Office of Fair Trading's Q&A that discusses a blogger's obligation to disclose financial benefits you may receive for endorsing products or services. As a reminder, under your Google Affiliate Ads For Blogger Online Program Terms and Conditions, You must comply with all applicable laws relating to the disclosure of financial benefits You receive for endorsing any products or services. For example, when you include a Blogger Affiliate Ad on Your blog, you will clearly identify, in a manner prominently displayed with editorial content on your blog such that it would be unavoidable to the average user, that the Blogger Affiliate Ad is an advertisement. 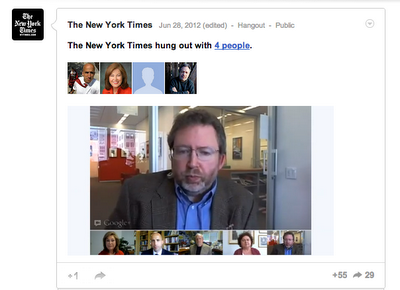 A few weeks ago, we talked about the possibilities around using Google+ Hangouts on Air to hold live broadcasts. This free feature allows you to live stream a conversation between 10 participants, directly from your Google+ page, your YouTube channel, and even your website, for a global audience to view. The New York Times has been hosting frequent Hangouts on Air to engage with their audience, with topics ranging from foreign affairs to professional baseball to voter concerns. Since setting up the +New York Times page in November 2011, the Times has aimed to create a hub for their online readers to not only discover news, but to also participate in discussion. Recently, the Times used Hangouts on Air to cover a breaking news story and reach a wide online audience. Just hours after the the Supreme Court’s monumental decision to uphold President Obama’s Affordable Healthcare Act, the Times became the first major media outlet to discuss the news via live web video. 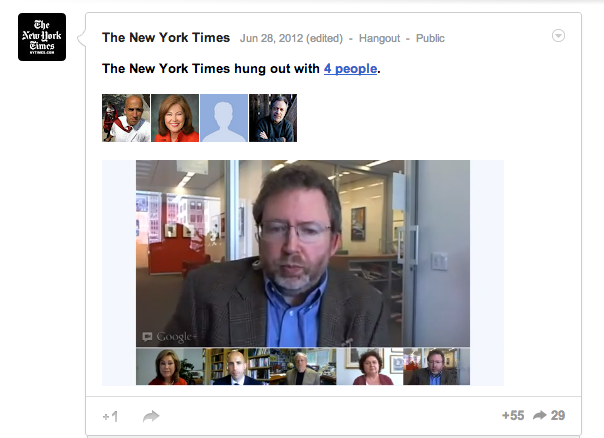 The Hangout video was broadcasted live on the +New York Times page as well as on the NYTimes Opinion page, allowing the discussion and analysis to be shared with a wider audience. The Times team prepared for a smooth Hangout by securing guest participants for their live broadcast a week in advance. When the date of the decision arrived, the Times added a graphic placeholder to the NYTimes Opinion page and published a post to their +page to publicize the upcoming Hangout. Once the Hangout started, they embedded the video directly into the Opinion page and also added a homepage promotion to their site to drive awareness. After the Hangout was completed, the Times team quickly edited the video footage on YouTube and uploaded it to the front page of NYTimes.com for additional visibility. For more information, read the full case study. If you’re ready to start broadcasting, be sure to review our tips and then get started with your own Hangout on Air. If you have any advice of your own to share about Hangouts, feel free to post them to our AdSense +page! This is the final post of a three-part series highlighting five user experience principles to keep in mind when designing your site. 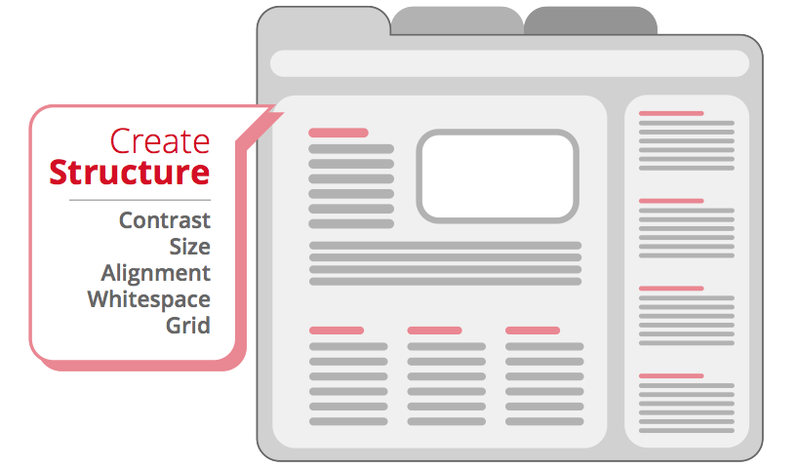 Using these principles will help provide a great experience for users on your site. To see these principles applied to an AdSense publisher’s site, we'll host a live Google+ Hangout on October 9th at 10:30am PT with an AdSense publisher. We will be applying these very principles to help improve their site! Go to the Google AdSense G+ page on the 9th to see it live! In our first and second posts in this series we discussed how to identify your user’s goals, the structure of your site, how to help guide users through your site and a few tips for a better experience on mobile. 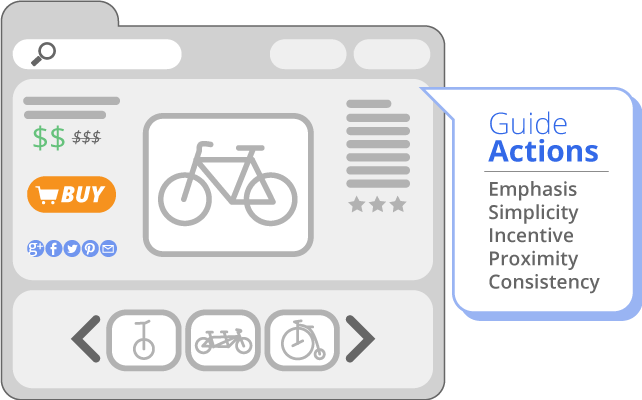 In this post we’ll provide our fifth and final user experience tip and lay out some strategies for converting a casual user into a loyal one. 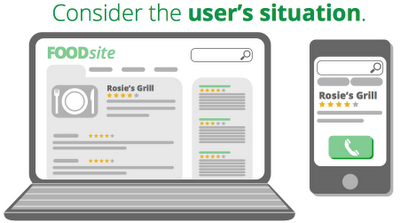 So far we’ve discussed ways to make sure you understand what your users are looking for and how to present it to them. 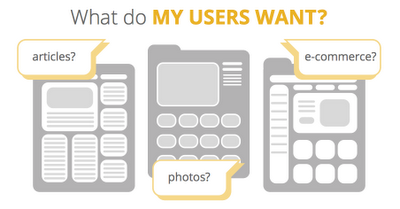 But you may be wondering how do you keep users coming back again and again? After all, repeat business is the lifeblood of businesses both online and offline. To get users to return, you need to do more than just answer their questions; you need to give them reasons to return to your site. New content: First and foremost, make sure to constantly provide new, high-quality content. 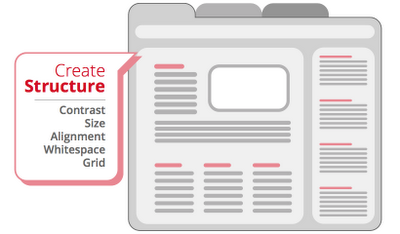 Next, make sure you are showcasing new content on your top landing pages. Related content: Show users similar content elsewhere on your site. Create a section that links users to popular content on the same subject. This will drive more engagement. Social: Make it easy for users to connect with you via their favorite social networks. All major social networks have widgets that you can put on your site to allow users to follow you. Once you have them make sure you push out your most popular content to drive return visits. Email: Make sure you have a way for users to subscribe to your email list for updates and/or a newsletter. 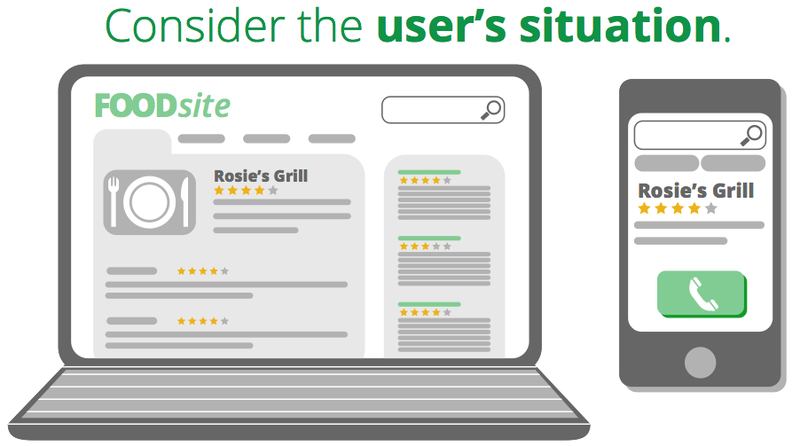 User engagement: Make it easy for users to interact with your content, through forums, a rating system or recommendations. 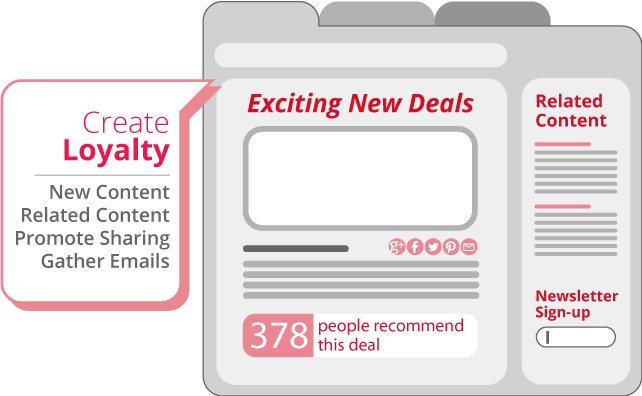 If you have a deal site where users can search for deals, you can first prompt them to sign up to be notified via email when new offers that match their interests are added to the site. 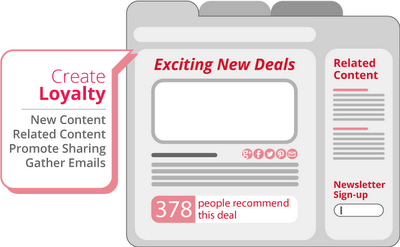 You can also showcase how many people recommend a deal so users see which deals are popular. We hope you enjoyed this three part series on user experience and we welcome your comments below! Thinking about implementing some of these changes? We’d love to hear about it! Let us know what you changed in the comments section below. Don’t forget to check out the User Experience Google+ Event Page on October 9th at 10:30am PST/1:30pm EST to join a Hangout On Air and see a real AdSense publisher put these principles in action! Allow users to subscribe to your updates via Google+. initiative, we’re hosting weekly "Mobile Q&A Sessions" for the month of October every Tuesday at 4pm GMT+1 / 8am PT on our AdSense +page. To learn more about going mobile or monetizing your mobile sites and apps, please drop by and join our interactive mobile hangouts. We’ll be answering frequently asked mobile-related questions and helping publishers with mobile-related issues. Create a Google+ account, if you don't already have one. Visit the AdSense +page and look for the weekly “Mobile Q&A Sessions” event. Let us know if you are planning to attend through the ‘Are you going?’ drop-down menu. Once the Hangout starts, you’ll receive a notification in the Google bar. Join the Hangout and ask your mobile-related questions. The sessions will be regular Hangouts where up to 9 people can join at a time. If the Hangout is full, keep checking back in, as people will drop in and out as their questions are answered. Please keep in mind that these sessions will be mobile-focused, so we’ll only be answering mobile-related questions. We look forward to hanging out with you soon. As part of our ongoing GoMo initiative, we’re hosting weekly "Mobile Q&A Sessions" for the month of October every Tuesday at 4pm GMT+1 / 8am PT on our AdSense +page. To learn more about going mobile or monetizing your mobile sites and apps, please drop by and join our interactive mobile hangouts. We’ll be answering frequently asked mobile-related questions and helping publishers with mobile-related issues.